Rafael Sanzio was an Italian Renaissance master painter and architect who was admired by his contemporaries. The inscription on his marble sarcophagus reads (translated): 'Here lies Raffaello who, when alive, Nature was afraid to be won by him, when he died, she wanted to die herself.' What passion. Saint George and the Dragon by Margaret Hodges and illustrated by Trina Schart Hyman is a beautiful retelling of a portion of Spenser's The Faerie Queen in which George, the Red Cross Knight, is sent by the Fairy Queen to face a dreadful dragon. Then dawn chased away the dark, a lark mounted up to heaven, and up rose the brave knight with all his hurts and wounds healed, ready to fight again. When the dragon saw him, he began to be afraid. Still he rushed upon the knight, mouth gaping wide to swallow him whole. And the knight's bright weapon, taking advantage of that open jaw, ran it through with such strength that the dragon fell dead, breathing his last in smoke and cloud. Like a mountain he fell, and lay still. The knight himself trembled to see that fall, and his dear lady did not dare to come near to thank her faithful knight until she saw that the dragon would stir no more. 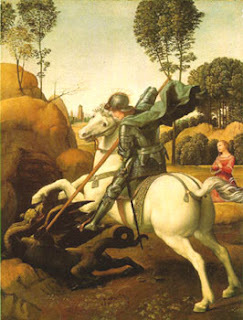 Yes, I think Levi and I will read St. George and the Dragon again today. 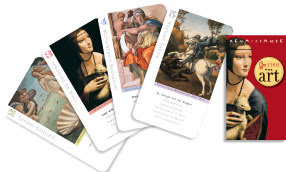 Renaissance Go Fish for Art by Birdcage Press is a gorgeous game of art. The object is to collect a set of masterpieces by each Renaissance artist featured. The cards are heavy and glossy. Many of the photographs are details of the artwork. Birdcage Press has wonderful art and science games. I have a few more on my wish list.